Rogers, Will (1975) . Joseph A. Stout, Jr. (ed.). Rogers-isms: The Cowboy Philosopher On Prohibition. Stillwater: Oklahoma State University Press. ISBN 0-914956-06-X. Rogers, Will (1977) . Joseph A. Stout (ed.). Letters Of A Self-Made Diplomat To His President. Stillwater: Oklahoma State University Press. ISBN 0-914956-09-4. Rogers, Will (December 1982). Steven K. Gragert (ed.). More letters of a self-made diplomat. Stillwater: Oklahoma State University Press. ISBN 978-0-914956-22-8. Rogers, Will (1983). Steven K. Gragert (ed.). Radio Broadcasts of Will Rogers. Stillwater: Oklahoma State University Press. ISBN 0-914956-24-8. Rogers, Will (February 1996). Steven K. Gragert and M. Jane Johansson (ed.). 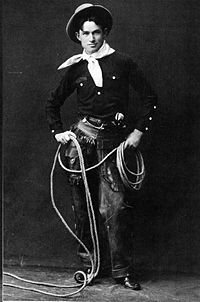 The Papers of Will Rogers: The Early Years : November 1879 – April 1904. Norman: University of Oklahoma Press. ISBN 978-0-8061-2745-3. Rogers, Will (September 28, 2005). Steven K. Gragert and M. Jane Johansson (ed.). 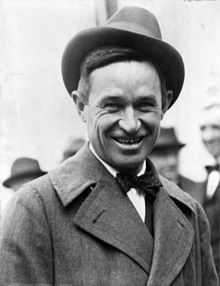 The Papers of Will Rogers: From Broadway to the National Stage, September 1915 – July 1928. Norman: University of Oklahoma Press. ISBN 978-0-8061-3704-9. Rogers, Will (September 28, 2005). Steven K. Gragert and M. Jane Johansson (ed.). 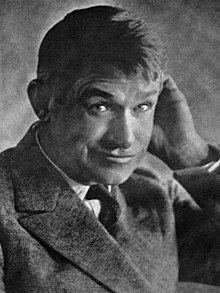 The Papers of Will Rogers: From Broadway to the National Stage, September 1915 – July 1928. Norman, Oklahoma: University of Oklahoma Press. ISBN 978-0-8061-3704-9. Rogers, Will (October 31, 2006). Steven K. Gragert and M. Jane Johansson (ed.). The Papers of Will Rogers: The Final Years, August 1928 – August 1935. Norman: University of Oklahoma Press. ISBN 978-0-8061-3768-1. ^ "Will Rogers' Burial". The Philadelphia Inquirer. September 19, 1936. p. 6. Retrieved March 08, 2017 – via Newspapers.com. ^ a b "Body of Will Rogers to be Sent Home". The Daily Tribune. May 19, 1944. p. 1. Retrieved March 08, 2017 – via Newspapers.com. ^ "The Great Ziegfeld (1936); Full Cast & Crew". IMDb. Retrieved April 15, 2019. ^ "You're a Sweetheart (1937); Full Cast & Crew". IMDb. Retrieved April 15, 2019. ^ "Look for the Silver Lining (1949); Full Cast & Crew". IMDb. Retrieved April 15, 2019. ^ "The Story of Will Rogers (1952) Full Cast & Crew". IMDb. Retrieved April 15, 2019. ^ "Mrs. Parker and the Vicious Circle (1994); Full Cast & Crew". IMDb. Retrieved April 15, 2019.